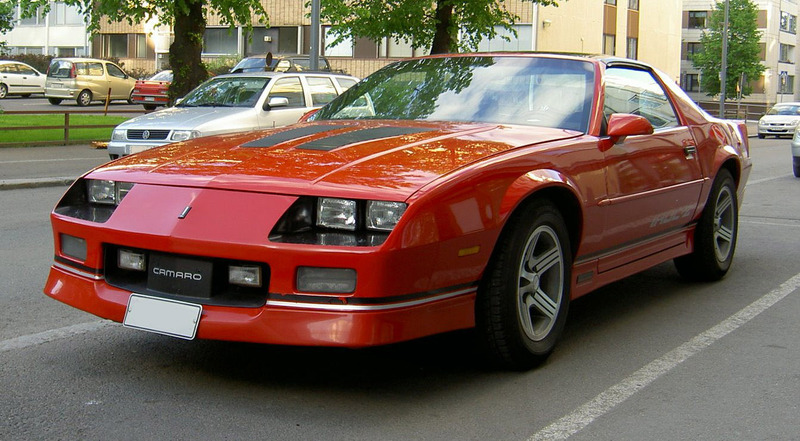 1986 was the last model year for the Berlinetta semi-luxury version of Chevrolet’s Camaro, and they were by far the rarest of the three Camaros types available. With only 4,579 Berlinettas built in 1986, Chevrolet sold more than eleven times as many IROC-Zs alone. There were few changes for the 1986 Berlinetta—among them the appearance of the federally mounted center high mounted stop lamp, new colors, updated interiors, and a new automatic closure for the large and heavy rear hatch. The base powertrain for the Berlinetta was the LB8 135 bhp 2.8 liter/173 ci multi-port fuel injected V6 with a five-speed manual transmission. Optional power was the $450 LG4 155 bhp 5.0 liter/305 ci V8 with a Rochester Quadrajet four-barrel carburetor which was paired with a $425 four-speed automatic transmission (the five-speed manual was not available with the V8 on the Berlinetta). Fuel economy with the base powertrain combination was 17 city/26 highway by the standards of the day (15/24 by modern standards). Moving up to the V8 dropped mileage ratings only slightly—to 17/25, and reduced the 0-60 mph time to a respectable 9 seconds in a car that weighed approximately 3,065 pounds. With a 16.2-gallon fuel tank (for some reason 0.7 gallons larger than with the V6), a V8 Berlinetta owner could expect a range of 275 to 305 miles with a 10% fuel reserve. Your $11,902 base price (about $27,500 in today’s dollars—just a little less than what a decently-equipped 2019 Chevrolet Camaro 2LT hatchback coupe goes for) bought standard mechanical and exterior equipment including power brakes, power steering, dual horns, and P205/70R-14 blackwall steel-belted radial tires (a size still readily available) on 14 x 7 inch wheels with Berlinetta-specific full wheel covers. Inside, custom cloth reclining seats with adjustable headrests, a Berlinetta-only steering wheel, intermittent windshield wipers, a roof console with a removable flashlight, a fold-down rear seat, a locking rear storage cover, Quiet Sound Group, and an AM/FM stereo radio with clock and four speakers were included. 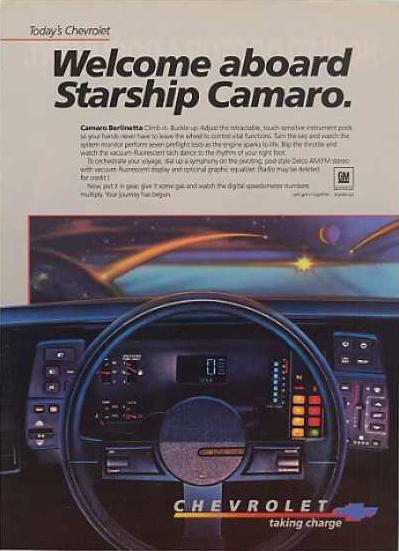 Of course, the most notable interior component in the Berlinetta was the “Welcome aboard Starship Camaro.” (yes, that was a real advertisement) electronic instrument cluster with dual adjustable control pods, a vacuum-fluorescent digital speedometer, and a bar graph tachometer. To an aspiring young audiophile, the killer feature of this interior was the optional (an extra $242) AM/FM stereo on a swivel with a “proper” upright (no slot) cassette deck and a five-band graphic equalizer. For 1986 only, the stereo received substantially improved backlighting. Among the many exterior and mechanical options were four-wheel disc brakes ($179 and only available with the V8), t-tops ($846—ouch! ), a rear spoiler ($69), halogen headlamps ($25), electric rear window defogger ($145), and nice looking Berlinetta-only aluminum finned wheels ($225). Inside, you could add cruise control ($185), Comfortilt steering wheel ($115), power door locks ($145), and Berlinetta-specific electronically-controlled air conditioning ($775). The Berlinetta could get expensive: I had no trouble getting getting a V8 version up to $15,400—about $35,600 in 2019 dollars or about what a loaded 2019 Camaro 3LT/RS hatchback coupe goes for. According to Hagerty’s valuation tools, all the money for a 1986 Berlinetta in (rare) #1/Concours condition is $13,400, with a more normal #3/Good condition car going for $6,200. In general, third-generation Camaros have good club support and are often available in the Hemmings Motor News classifieds and eBay Motors. However, Berlinettas of any year (Chevrolet first brought them to market in 1979) are rare—though a couple showed up at auction in early 2019. There was a Bright Red 1984 Berlinetta with tan cloth seats, a V8, and 34,000 miles available for sale in Hemmings for $11,000 when I last checked in February 2019. Thanks to the GM Heritage Center for some really specific information on the 1986 Berlinetta. I walked past a small junkyard in Philadelphia yesterday. A maroon Citation X-11 was recognizable though not really well-preserved, but it did encourage me to finally publish this blog post. Chevrolet’s Citation X-car is now known mostly for being constantly recalled, but there were some positive points. The sporty X-11 version was a definite glimmer of hope. The Citation X-11 was built around a specific engine for its entire life. For 1981, the $1,498 X-11 package featured the LH7 2.8 liter/172 ci “HO” V6 with Rochester Varajet II 2SE two-barrel carburetor, making 135 bhp, instead of the 110 bhp that the “generic” LE2 V6 made in other Citations. Upgrades from the LE2 to the LE7 included a higher compression ratio (8.9:1 versus 8.5:1). The standard transmission was the four-speed manual with a three-speed automatic optional. The four-speed along with the X-11‘s specific axle ratio was good enough to give a 0-60 time of around 8.5 seconds. Other changes for 1981 were the addition of a hood bulge and aluminum alloy wheels. The X-11 also received power brakes and the F41 Sport Suspension, which featured revised shock absorbers, stiffer anti-roll bars, and P215/60R14 tires (a size still available thanks to BFGoodrich and Riken). Inside was an instrument panel that included a five-gauge cluster, a leather-wrapped sport steering wheel, and cloth bucket seats. 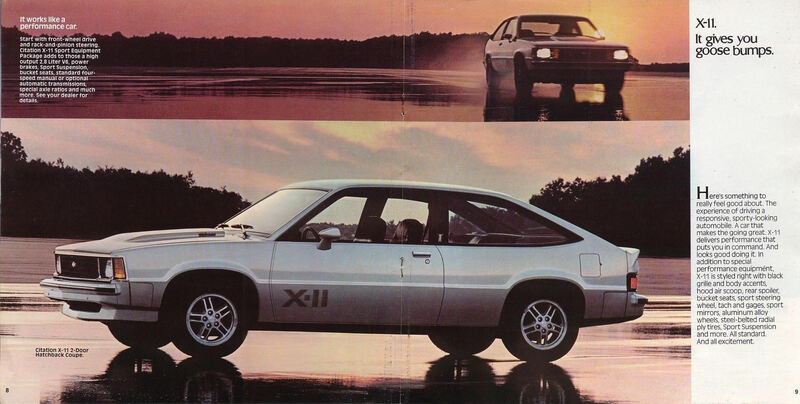 Exterior X-11 specific appearance items included a black grill and body accents, sport mirrors, and a rear spoiler. Standard exterior and mechanical equipment on every Citation included front wheel drive, rack-and-pinion steering, front disc/rear drum brakes, and a Delco Freedom Battery II. Inside, dual-speed electric windshield wipers, sliding door locks, locking glove compartment, and a Delco AM push-button radio with two front speakers were all included. X-11 page from the 1981 Chevrolet Citation brochure, linked from the Old Car Manual Project’s amazing brochures section. Options available included air conditioning ($585), cruise control ($123), intermittent wipers ($41), rear defogger ($107), and tilt steering wheel ($81). X-11‘s do sometimes show up in the Hemming’s Motor News classifieds and on eBay Motors, but, as I write this in February 2014, there are none for sale. Make mine Silver Metallic, please. 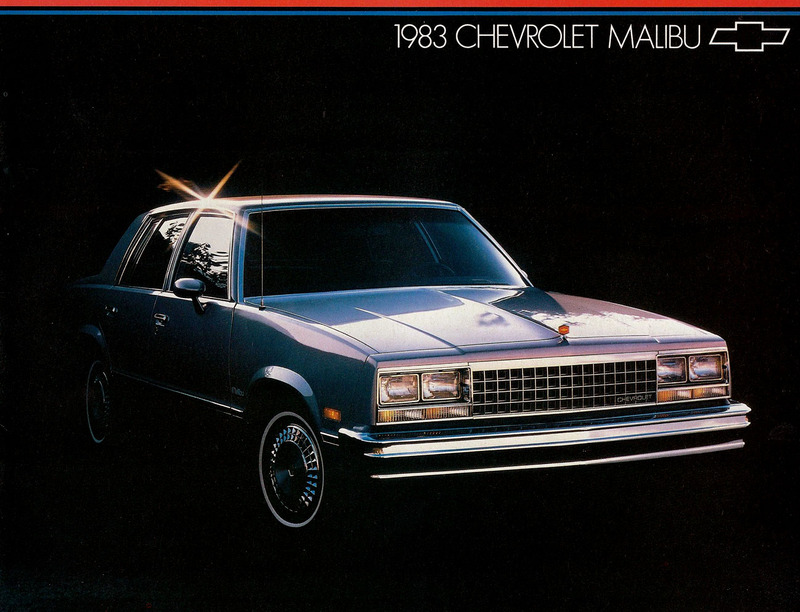 In early 2014, the Hemmings Daily blog had an entry that mentioned that the Chevrolet Malibu was turning 50 years old, so I thought a post about the last of the 1980s Malibus would be appropriate. Five years later, I’ve modified this post enough to consider it completely changed. 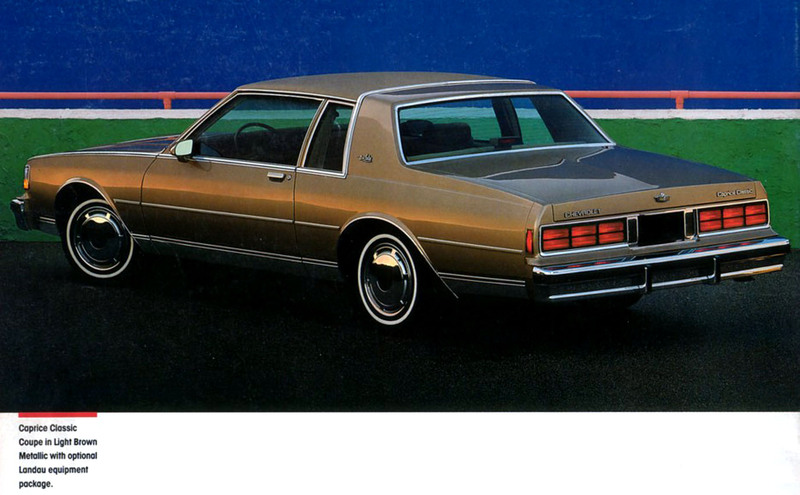 The 1983 Malibu was the final rear-wheel-drive Malibu and the last Malibu of any kind until the 1997 model year. For 1983, Chevrolet eliminated the Malibu Classic designation and reverted to Malibu as the single trim level, which you could get in either a four-door sedan or a five-door wagon. Standard motivation for the 3,100 to 3,200-pound sedan (weight largely depended on engine choice) was provided by the evergreen LD5 3.8 liter/231 ci V6 with a two-barrel carburetor hooked up to a three-speed automatic transmission, making 110 bhp and getting 20 city/29 highway by the standards of the day. Power options included two different diesels (a $500 V6 and a $700 V8 that just about no one purchased) and the LG4 150 bhp 5.0 liter/305 ci V8 with a Rochester E4ME four-barrel carburetor rated at 18 city/26 highway. With an 18.1-gallon fuel tank, the owner of a V8 Malibu could expect a range of 325 to 360 miles. Performance was not exactly sparkling: 0-60 took a little over 11 seconds with the V8. Standard exterior and mechanical equipment on the $8,084 Malibu V6 sedan (about $20,700 in today’s dollars or a little under what a 2019 Malibu L costs) included quad rectangular headlamps, high-energy ignition, a Delco Freedom II battery, power front disc/rear drum brakes, power steering, and P185/75R14 glass-belted radial tires (a size currently available thanks to Hankook) on 14-inch wheels. Inside, a base Malibu came spare—highlights were a vinyl bench seat, a cigarette lighter, a locking glove compartment, and a day/night rearview mirror. Moving to the V8 brought the Malibu sedan’s base price up $225 to $8,309 (about $21,300 in 2018 dollars). Options that were ordered in more than 50% of 1983 Malibus included air conditioning (the most expensive option at $725), tinted glass ($105), remote left-hand side-view mirror ($22), and rear window defogger ($135). 1983 Chevrolet Malibu brochure cover, linked from the Old Car Manual Project’s amazing brochures section. Interestingly, you could still order some performance-oriented options for the Malibu even in its final year. A limited-slip differential ($95), performance rear axle ($21), gauge package with trip odometer ($95), heavy-duty battery ($25), heavy-duty cooling, rally wheels ($108), and the F40 heavy-duty suspension ($26) were all available, though I’m not convinced they found a lot of buyers among the total of 117,426 Malibus purchased in 1983. This generation of Malibu does come up for sale every once in a while in the Hemming’s Motor News classifieds or on eBay Motors, but there were no reasonably stock examples available when I updated this blog entry in February 2019. Other rear-wheel drive G-platform (designated A-platform before 1982) cars I have written about include the 1984 Buick Regal Grand National coupe, the 1981 Chevrolet Monte Carlo Sport Coupe, the 1981 Oldsmobile Cutlass Supreme coupe, and the 1980 Pontiac Grand Am coupe, and the 1987 Pontiac Grand Prix coupe. In 1985, Chevrolet kicked the third-generation Camaro up a notch (or more) with the release of the IROC-Z, inspired by the International Race Of Champions race series. The IROC-Z was an option package (B4Z) for the Z28 and cost $695. Suspension upgrades specific to the IROC-Z were Delco/Bilstein shock absorbers for the rear wheels and 16-inch wheels all around with Goodyear Eagle GT P245/50VR16 tires—large for the day and a size still readily available. The IROC-Z also included louvered hood inserts and more aggressive ground effects and spoilers than the Z28. Finally, it was lowered half an inch compared to the Z28. 1985 Chevrolet Camaro IROC-Z, courtesy of M62 from the Wikimedia Commons. Three engines were available in 1985 for the IROC-Z, all sized at 5.0 liter/305 ci: standard was the LG4 carbureted motor at 155 bhp. The optional engines available depended on transmission—if you chose the five-speed manual, you could get the High Output carbureted L69 with 190 bhp (not available on the garden variety Z28) while if you went with the four-speed automatic, you could choose the Tuned Port Injection LB9 at 215 bhp. If you cared (and I think most of the target market did not), mileage wasn’t great: the EPA ratings of the day were 16 city/22 highway for the LG4, 15/24 for the L69, and 16/22 for the LB9. According to Hagerty’s valuation tools, all the money for a 1985 IROC-Z in #1 condition is $19,400. IROC-Zs make regular appearances in the Hemming’s Motor News classifieds. As I write this in November 2013, there’s a red 1986 with 89,000 miles for sale for $8,000. Please make mine Blaze Red, with the optional and expensive when new ($821) t-tops. I know they often leak, but I like the look. Interestingly, Hemmings also has a white 1985 IROC-Z for sale. It has 765 miles, and the seller wants $50,000 for it. At first, this seems ridiculous, but then this particular IROC has special provenance: it is one of the two Live Aid cars from July 1985, with almost 100 signatures of folks such as Mick Jagger, Bette Midler, and Jimmy Page preserved in clear coat.